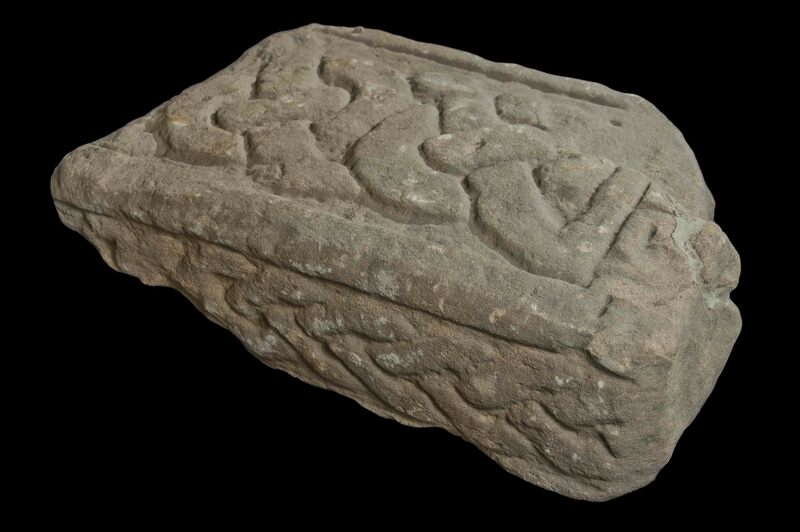 In a previous post in July, I discussed how Dr Aaron Watson and I were invited to help the parish council of Holy Trinity church at Bolton le Sands, Lancashire, in recording their early medieval carved stone monuments and re-displaying them for the public and parish. I’ve attempted to advise the church on the stones, which have been recently discussed by Professor Richard Bailey (2010). Meanwhile, Aaron took some awesome still photographs but also he has created some photogrammetric models of the two stones for the church to use in their displays. 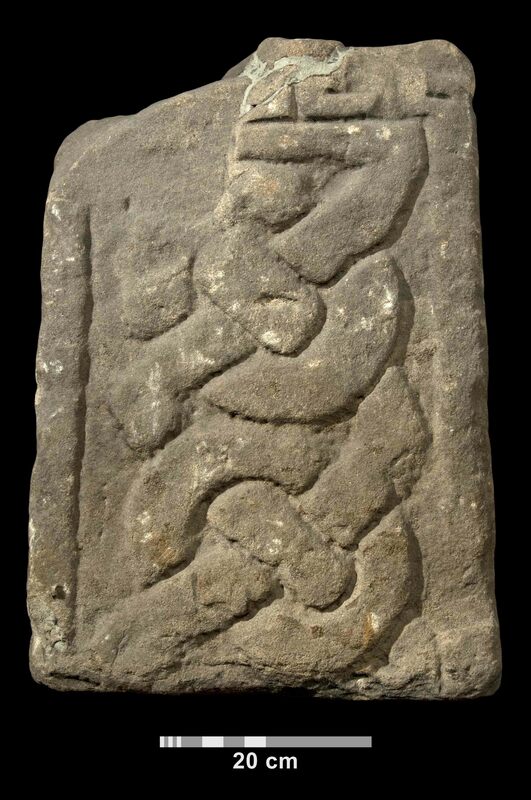 I regard Aaron’s images to be at least as good, but different and distinctive, from those published in the Corpus of Anglo-Saxon Stone Sculpture. Not only that, they are in colour rather than black-and-white. Furthermore, they are digital, higher-resolution, and less starkly lit, giving a more refined sense of some of the details. As such, I want to point out some of the ways in which they prompt variant interpretations to that presented in the text and images of Professor Richard Bailey’s 2010 Corpus volume for Cheshire and Lancashire (Bailey 2010). 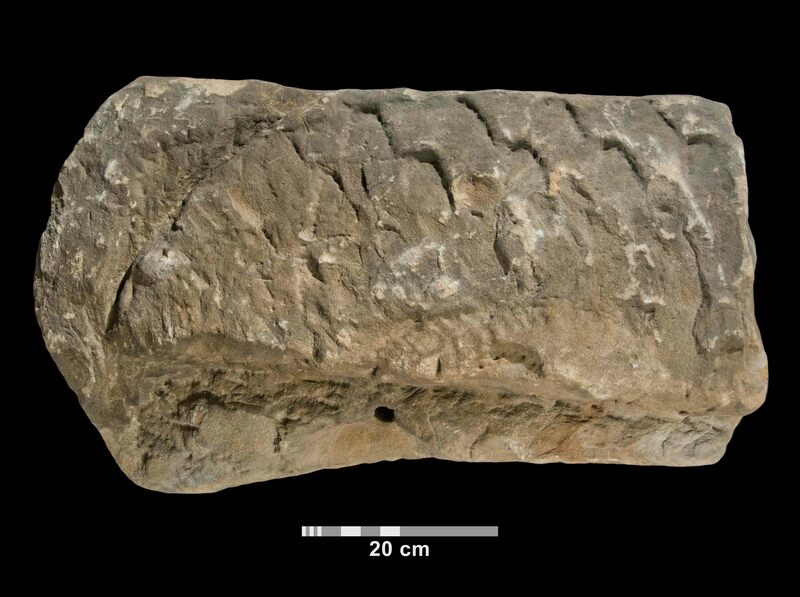 The reason I’m interested in them is that one of the two fragments regarded as early medieval, and Viking Age in particular (10th/11th century), might be a fragment of a type of recumbent grave-cover popularly known as ‘hogbacks’. 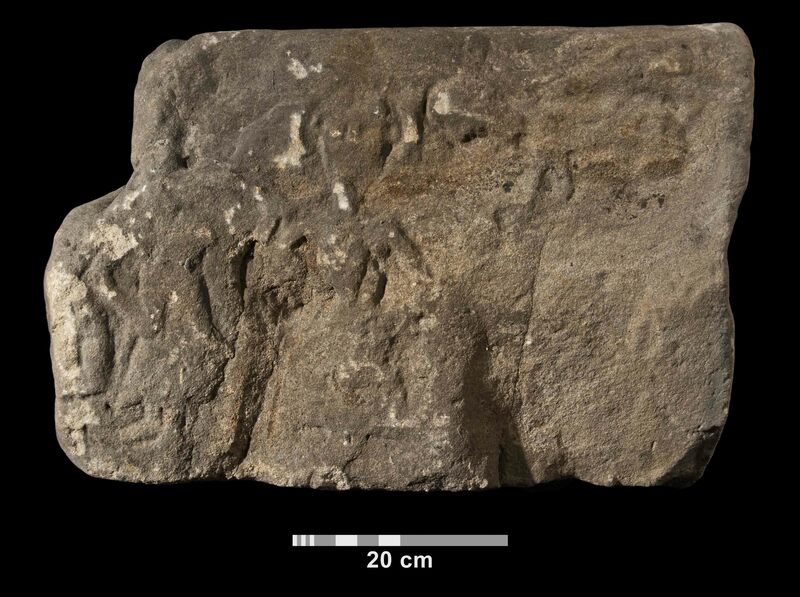 In addition, both stones are good examples of the complex biographies of early medieval stone monuments, with evidence of at least two (for BlS 1) or three (for BlS 2) phases of carving, plus later damage and wear. This stone is most likely a fragment of a cross-shaft – either marking a grave or a significant location in the churchyard or its environs. Bailey (2010: 167) dates it to the 10th century, with 12th-century recarving on Face C. He regards the original carving’s execution as ‘bold but badly set-out’. This stone’s broad Face A possesses two ring-encircled twists, executed in a brand strand, ending at the top in a bar terminal. This is set within a border moulding. What Bailey’s description and photographs don’t bring out is what is happening above the bar terminal – it seems as if there is some kind of fretwork pattern or perhaps a figural scene succeeding the plaitwork. 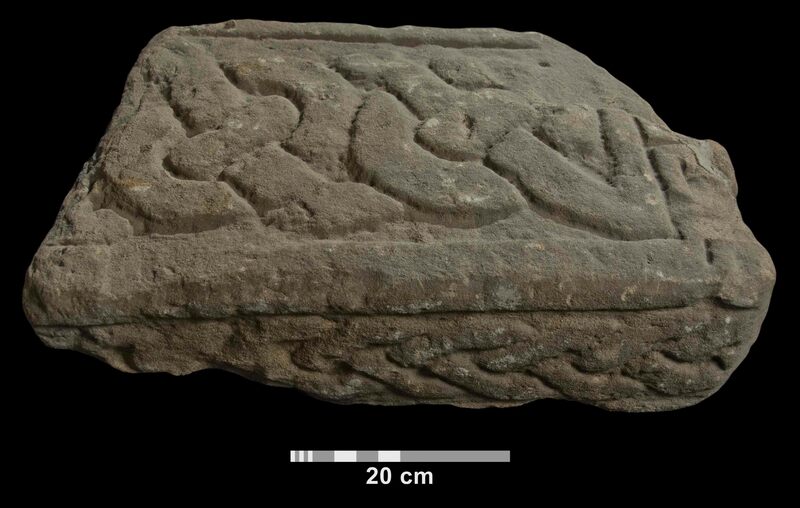 Also, what Bailey doesn’t mention is that there are faint traces of diagonal striations on the moulded borders which might be worn indications of an original cable moulding design as found on surviving more prominently on other10th/11th-century carved cross-shafts from Cheshire and Lancashire, as from Neston 1-4. The narrow Face B retains fragments of lateral border mouldings flanking a panel of three-strand plait. Face D is heavily worn but does bear faint traces of similar broad-strand plait and moulding too. Note: Aaron didn’t take any stills of this side, but he took lots of photographs of it to be integrated into his 3D photogrammetric model for use in the church. I include here a screen capture from the model. Now the Corpus picture is more stark, and Aaron’s more subtle. However, I’m quite certain there is a fourth figure on the far left, and that the left-hand figure is facing this person: at least their feet point leftwards. There is also a limb (or pigtails), extending from the left-hand figure towards the central figure. Whether the central figure is the Virgin Mary with Christ-child or not, I’m not so sure. When I look at it, ‘Mary’ has a triangular beard. I’m also not sure how a 12th-century date is arrived at by Bailey as he simply doesn’t say. Is this is a guess or are there parallels elsewhere? This stone is a badly damaged fragment of hogback stone. The element that suggests it is a ‘hogback’ is the bowed section of roof, with its tegulae. In other words, Bailey (2010: 167-68) argues this is a fragment of a skeuomorphic house-shaped grave-cover. Bailey continues with the Lang interpretation that these monuments are high-status but also signal the Hiberno-Norse identity of the deceased and/or his/her kin. Bailey notes two lines of type 2c tegulation. I can see at least three lines of tegulae surviving, albeit badly damaged. There might be traces of a fourth line on the far-right of the face. To be fair, these are plain on both the Corpus’s photographs and on Aaron’s. Bailey doesn’t comment on the nature of the later damage. 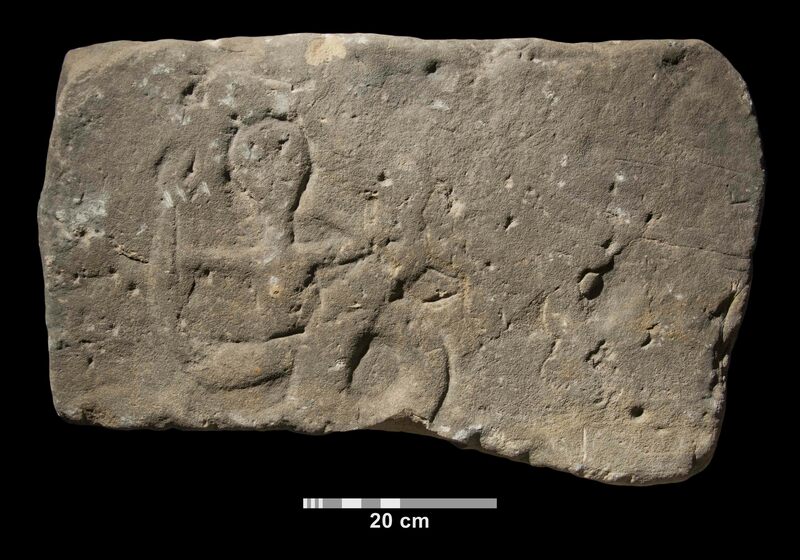 This stone not only has evidence of being re-cut on its back (Face C, see below), but there is evidence of later reuse with grooves that marks the swing of a door or window around a pivot-hole at the bottom of Face A. These take two forms, an arc on the left of the face, and a wider groove in the middle-bottom area of the face. Bailey describes this is cut away and bearing secondary decoration in light relief at one end. The very flat and crude carving shows an en-face figure grappling with a serpent. Again Bailey regards this as 12th century without an explanation, although he cites parallels for 11th/12th-century reworking of hogbacks at Govan and Tyninghame. Based on both the Corpus and Aaron’s images, I would go further to state that the human figure is holding a spear or lance in his left hand and thus impaling the head of the serpent. Bailey (2010: 168) suggests it was reused as a tympanum, but it is unclear what evidence there is for this. As previously posted, these stones have been displayed without a clear sense of their significance and the need for their conservation. The choice to photograph and create photogrammetric models of these images was aimed to enhance academic and popular awareness and interest of the fragmented monuments. Thanks to Aaron’s work, and my input too for captions and interpretation, the stones are going to be put on re-display within the church. Of particular significance, because I argued to the church that these two monuments are particularly important, and that their 12th-century or later reuse is as important to display as their original surfaces, they are going to be re-displayed so both broad sides can be viewed by visitors. I’m rather proud of this contribution to the display of two fascinating fragmenets of early medieval stone monuments. Bailey, R. 2010. Corpus of Anglo-Saxon Stone Sculpture Volume IX: Cheshire and Lancashire, Oxford: Oxford University Press.